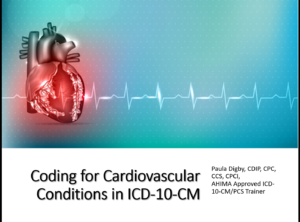 Due to changes in the ICD-10-CM guidelines and because heart disease is such a prevalent issue for the US healthcare industry, it is important for coders to become adept at applying both the guidelines and the codes associated with heart disease in ICD-10-CM. Utilize learned information to make logical decisions regarding coding for cardiovascular conditions. Apply guidelines for selecting accurate codes for cardiovascular conditions.